SUPciety brings paddleboard tours to French Lick. SUPciety Stand UP Paddle owner Ryan Niederberger, 35, can describe his first time on a paddleboard in one word: “Euphoric,” he says. He recalls the sensation clearly – the glide of the board on the water, the way time fell away. But there’s something about the soul of the sport that he can’t quite put into words. “How do you explain walking on water?” he asks. That first paddle was six years ago near Cape Coral, Florida, where Niederberger owned a computer repair shop. Before long, he would own a paddleboard rental stand, float alongside dolphins and manatees, participate in more than 10 races and paddle 14 miles each way to a shore-side Christmas party while wearing a Santa hat. When he moved to French Lick a year ago to be with the woman who is now his wife, Niederberger wanted to bring that euphoric feeling with him. So, he opened SUPciety paddleboarding and began leading tours of Patoka Lake, the second-largest reservoir in Southern Indiana. The lake is best known for its bald eagles, river otters, ospreys and freshwater jellyfish, as well as striking landmarks like waterfalls. Niederberger says he’s particularly fond of showing SUPciety paddlers the cliff faces along the shore of the 8,800-acre lake. “Everyone I’ve taken back there has had their jaw drop,” he says. Niederberger takes groups of about seven people on daytime, sunset and nighttime paddles. While daytime paddles focus primarily on scenery, nighttime paddles are a little different. Participants are equipped with glow sticks and lights on the front of their boards to help illuminate the dark. “It’s really the energy of the group more than the visuals that you’re there for,” Niederberger says. Last season, groups came from all over Indiana and northern Kentucky to paddle with Niederberger. That success was a joy, he says, but not really a surprise. He fell in love with paddleboarding, and says he knows others will, too. SUPciety’s 2018 season runs through late September, with tours costing $50 per person for two hours. For more information or to schedule a paddle, visit www.supciety.com. Niederberger says beginning paddlers can pick up the sport in just a few minutes, and he rarely has customers fall in. Each of his paddles begins with a free lesson, so newbies can learn the basics. The youngest person Niederberger has taken on a paddle was 7. He says there’s really no maximum age to learn paddleboarding, as long as you’re healthy enough to stand on the board. Only moderately, he says. The benefit of being fit is being able to go longer distances. 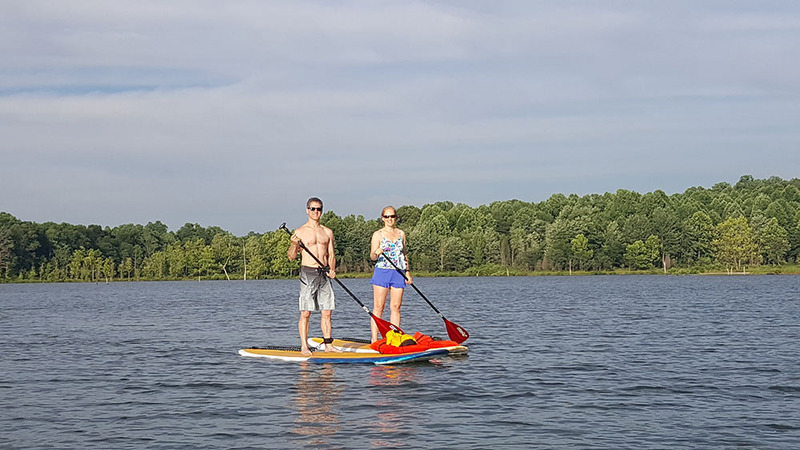 People of all fitness levels can participate and explore Patoka Lake. How many people can go on a paddle? The most people Niederberger has taken paddling in Indiana is seven, but he owns 15 boards and is able to take larger groups if requested.